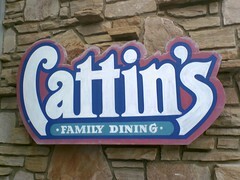 As noted by Wolfpack, local restaurant Cattin’s has closed as of this morning. Quite sad, as I know that it was a favorite eatery for many people. 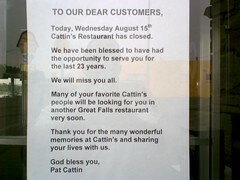 Pat Cattin has posted a farewell sign on her his door to thank her his customers; if you would like to leave a message for Pat and the rest of the Cattin’s crew, leave your comments here and I will deliver them. Pat Cattin is a he. Wow- the Trib JUST posted an article about this! I think they should hire Dave here for breaking news bulletins! See, it was happening here (on Dave’s site) and the Tribune was there (in the brick building by the river). David, did they call you for your take on the situation? Yep – Jo Dee Black called me yesterday evening. Do you really think they were like Denny’s? I feel that 4B’s was closer than Cattin’s. Pingback: Park-n-Ponder Closing? | Greater Falls!